We are Team Awesome, and we have purchased a house. Currently, the jury is still out on whether this was the best or the worst idea ever. Team Awesome consists of Tom and Sarah (husband and wife), plus Clarence-the-cat (fat, orange, crafty) and Agatha-the-cat (small, black, dumb as an adorable brick). A third cat, Stretchy-Toes (medium-sized and stripey) has wormed her way onto the team, too, even though Tom insists that three cats are too many cats! Our new house is across the street from Tom’s dad (Pop) so he figures into the narrative pretty regularly, too. The house is in a very small town and is technically a 1976 double-wide. It is what could definitely be defined as a “fixer-upper” (to state it mildly). We have a lot of plans for remodeling this house, despite the fact that razing it would probably be the smartest idea. We don’t really have any idea what we’re doing, but it seems like we should be recording how it goes. More than anything, this blog will hopefully be a sort of online scrapbook so we can look back and see our progress (or lack thereof). We got official possession about 10:30pm on June 7, 2014. As the older owner drove west, Tom and I stared at each other in horror. The house was a bit of a disaster – there was trash everywhere, cats everywhere, stuff everywhere. All we could say was, “What have we done? !” Since then, things have been improving, but we still have moments – and probably will for pretty forever – where we just stop and look at each other and ask that same question again. We’ll see how the blogging goes – we’ve been so busy in the first month of ownership that I’m not sure whether I’ll be able to keep this up or not, but I’ll try. Thanks for stopping by, and feel free to email at itsthegoodlife15@gmail.com with thoughts, questions, or suggestions! 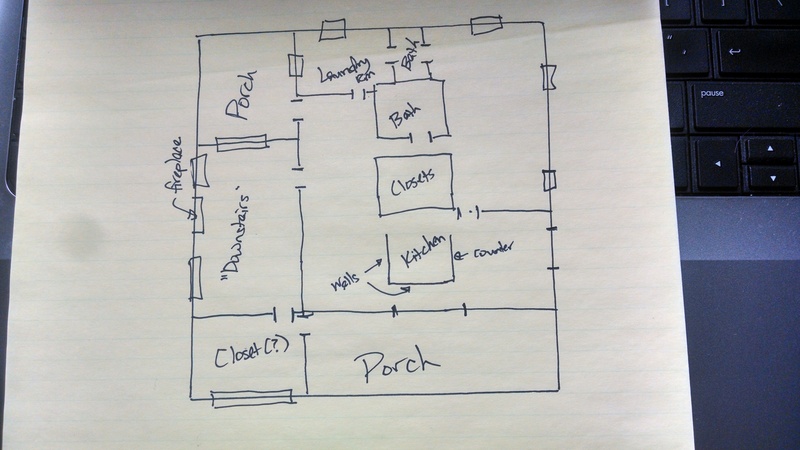 Also, I’ve tried to draw a basic floor plan of the house, but, as you can see, I’m no architect! Please note: not to scale. At all. As of 9/17/16: Just a moment to say that the Team’s dynamics have shifted slightly since I originally started this blog. Both Agatha and Stretchy-Toes disappeared last fall, the sometimes-fate of outdoors cats. I really think coyotes may have gotten them both, as there was no sign that they were hit by a car. It’s just weird they went missing within a couple of weeks of each other. However, we did add Waylon the border collie in spring of 2015. He’s not quite as adorable now as he was in those pictures but… he’s still pretty darn cute.